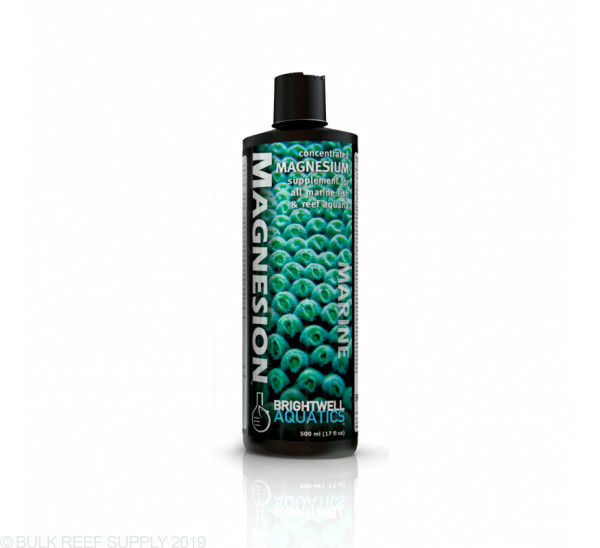 Provides magnesium, which helps regulate the balance between calcium and carbonates in aquarium water, and is a component of aragonite, the mineral secreted by reef-building organisms such as corals, clams, and their allies to form skeletal material. Basic: Shake product well before using. Add 5 ml (1 capful) of product per 20 US-gallons of aquarium water every other day or as needed to maintain the magnesium concentration within a range of 1,290 - 1,320 ppm. When used in this fashion, 250 ml treats up to 1,000 US-gallons (3,785 L). Advanced: Determine the magnesium concentration in the aquarium using an accurate test kit before supplementing. Shake this product well before using. 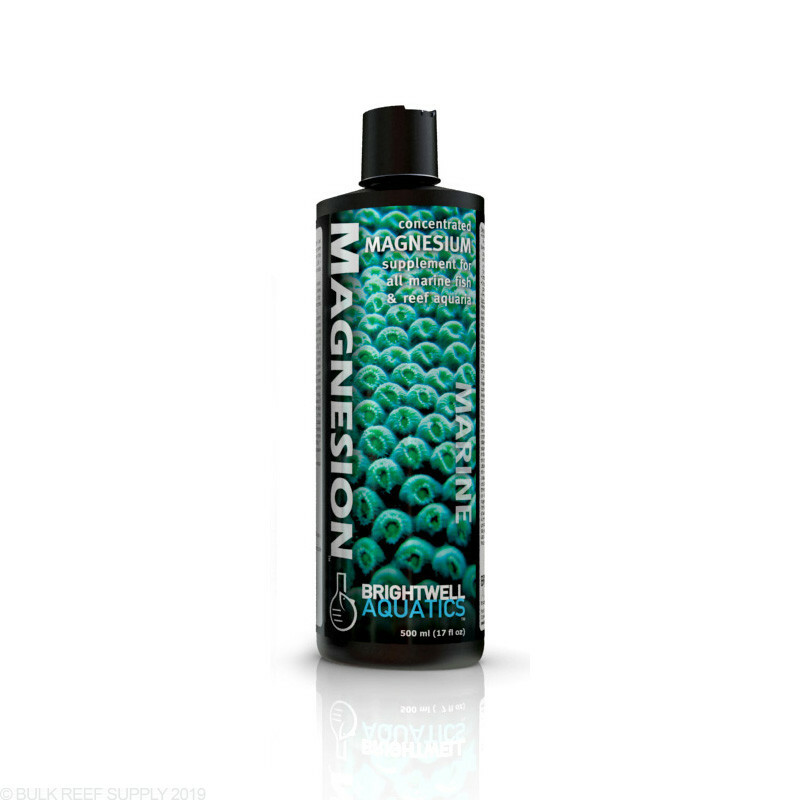 Each ml of Magnesion will increase the concentration of magnesium (“[Mg2+]”) in 1 US-gallon (3.785 L) of water by 26 ppm. If the initial [Mg2+] in the aquarium is below 1,288 ppm, add this product at the maximum rate of 10 ml per 20 US-gallons daily until the desired concentration is attained, then dose daily or weekly as needed (see below). Always try to maintain the [Mg2+] within a range of +/-10 ppm. To determine the dosing rate of this product once the desired [Mg2+] has been acquired, measure the daily rate of magnesium uptake (i.e. the decrease in magnesium) in your aquarium by measuring the aquarium's [Mg2+] at the same time each day over a one- to two-week period. To determine the daily dosing rate (preferable to weekly dosing) for magnesium maintenance: estimate the volume of water in the entire aquarium system; divide the daily decrease in [Mg2+] by 26; multiply this number by the volume of water in the system to get the daily dosage required (ml) to maintain a stable [Mg2+]. Daily dosing maintains a more stable [Mg2+] (and more natural environment) than dosing weekly, in which the [Mg2+] spikes just after dosing and then gradually decreases throughout the course of the week. A concentrated, to-the-point, essential dosing chemistry for your reef tank. I run mostly SPS, with lots and lots and lots of acropora species. I could not keep up with my daily dropping of Mg. This helped me gain a foothold- for now. I dose daily 10mL. 4.5 stars since I cannot use it in a dosing unit correctly since you have to "shake before use" application. Otherwise, a very solid product. Buy 2 L of this if you can, especially if your demand id off the newbie scale.